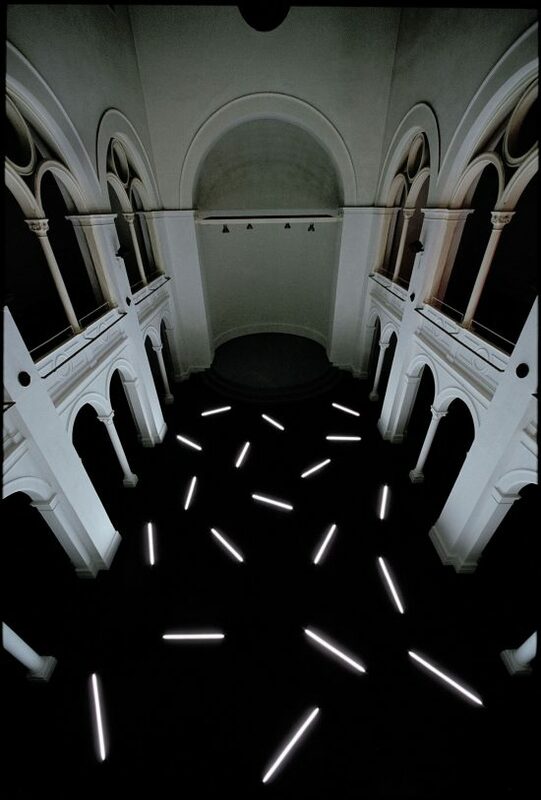 Fluorescent tubes were laid out on the floor of Studio 1 at the Künstlerhaus Bethanien, which used to be a chapel. The tubes were almost entirely wrapped in black tape; only a thin strip of light, about 1 mm wide, was visible. The light shone upward and it was so intense that it seemed to obliterate the space around it; as a consequence, the lines of light appeared to be floating. The public was only allowed onto the gallery. Short quiet sounds moved at high speed among six loudspeakers that had been set up around the gallery.